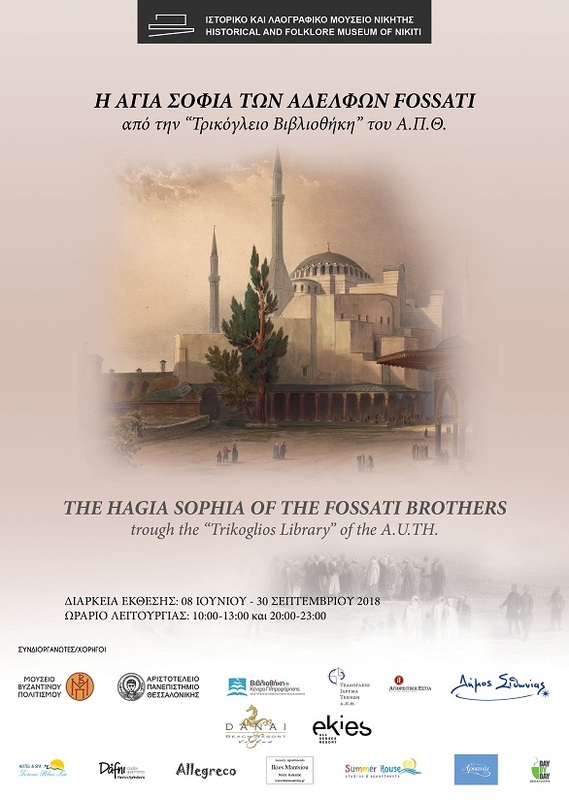 The Municipality of Sithonia, the Aristotle University of Thessaloniki, the Museum of Byzantine Culture and the Pilgrim Bureau co-organize the temporary exhibition under the title: “The Hagia Sophia of the Fossati brothers through the Trikoglios Library of the A.U.TH.” in the Historical & Folklore Museum of Nikiti (exhibition duration 8 June – 30 September 2018), on the occasion of the celebration of the 90+ years of operation (1927-2017) of the Library & Information Centre of the A.U.TH. The museum is currently hosting an exhibition of 22 lithographs by Gaspare Fossati, depicting the former Greek Orthodox Christian basilica of Hagia Sofia in the city then widely known as Constantinople. The lithographs were created between 1847 and 1849 by the Italian-Swiss architect and his brother, Giuseppe Fossati, also an architect. Visitors can also see modern digital photographs of the famed Byzantine cathedral. Parallel targets of the exhibition are the promotion of the material of the “Trikoglios Library” and, on the other hand, the emergence of the always topical issue of the protection of monuments of different peoples, cultures and religions, according to the international conventions, the principles of UNESCO and of other international organizations.